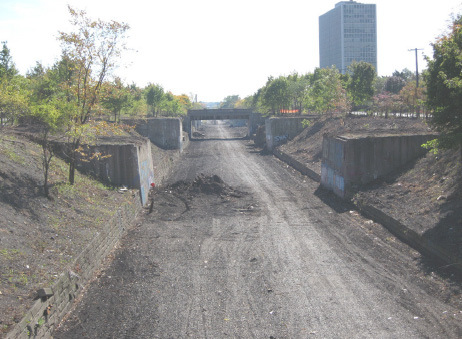 The project area comprises of an abandoned railroad corridor in Detroit, Michigan. City of Detroit purchased the project site in November 2012 for redevelopment into non-motorized greenway for public recreation. The project redevelopment plans also included pedestrian and bike paths, site lighting, benches, security devices and landscaping. A portion of the property was slated for rail car staging operations. Phase I Environmental Site Assessment (ESA) performed in accordance with American Society for Testing and Materials (ASTM) Practice E 1527-05, consistent with U.S. EPA All Appropriate Inquiries (AAI), Rule 40 CFR Part 312. Phase II ESA to evaluate the recognized environmental conditions or items of potential environmental concerns identified during the Phase I ESA. Study comprised of drilling soil borings and chemical analysis of soil and water samples. Baseline Environmental Assessment (BEA) report prepared on behalf of the City of Detroit to seek exemption of liability against existing subsurface contamination at the project site. Due Care Plan prepared to satisfy City’s continuous obligations to prevent exacerbation of contamination and to protect public health and environment in regard to the contamination that exist at the project site.